Hehehe, the most exciting weekend for pooches living in Singapore is here! 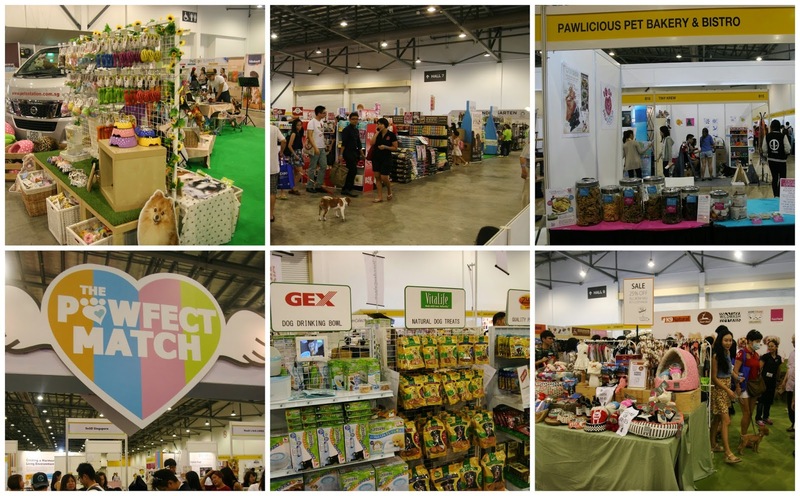 'Cos it's PET EXPO 2015. And we went a little cray-cray there today. Yap, Mummy is THAT obsessed with us. As we wanted to beat the crowd (parking woes especially), Mummy decided to bring us there on the first day. We waited patiently (not) while Mummy went to collect our tickets. 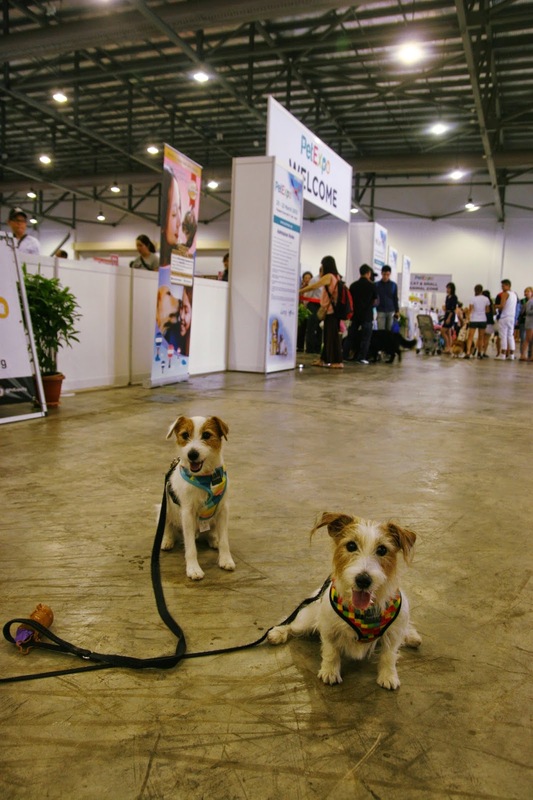 This was Pecan ah ma's first Pet Expo and she was loving it. As for me, (I was here last year to help Mummy out with her work then) I'm loving how much bigger the fair is this time round. Not only are there more exhibitors, the variety has increased! We started by taking a look at the whole place and planning where to drag Mummy to. To meet the love of my life - Jager!!!!! I missed him so much la. So we pitched a tent and took a little break. We simply shamelessly took shelter at Jager's booth and took ownership of the tent for a good ten minutes. Once we recharged, we continued with part two of our shopping spree. "Why is Pecan on the poster?!" No la. That's actually Bella! We stopped by Howlistic Life to say hi to Auntie Pauline and decided to hop onto their centre stage. Kinda keeping our fingers crossed that we made it on time for their carnivore feeding time. Since we were there, we decided to buy some stuff too. Taking a break while waiting to checkout. Pecan did come with an agenda today though. 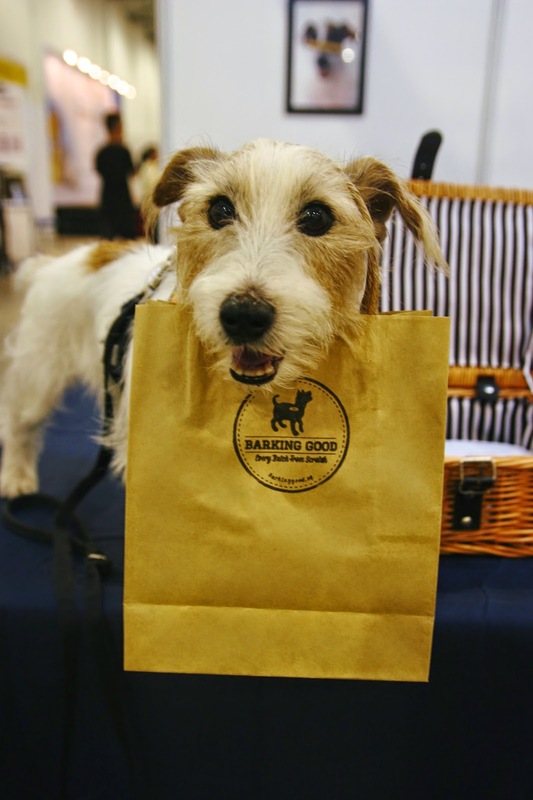 After costing Mummy a good four-digits on her recent teeth extraction, Pecan had to earn her keep to pay her debts by working part-time at Barking Good! She actually went to collect the sampler set we pre-ordered online! We also went to say hi to my favourite Daycare person, Auntie Ashley from Wooga! Hehehe, and of course to give her our support for her new line of air-dried treats, Bites. Most importantly, we got tons of pats and treats from her! Oh oh, and we met a new brunch of friends! After a good four hours of scouting for deals and stocking up for god-knows-what, we were pooped. But oh boy was it fun!!!!!! yet another a Fuzzyard Bed from Howlistic Life! It sure is a timely purchase. Now we each have an awesome bed to rest our tired paws. Hehehe, a little birdie told us that we might be swinging by again this Sunday!!! Time to ask Grandmummy for some money to buy treats to fill our little tummies again! 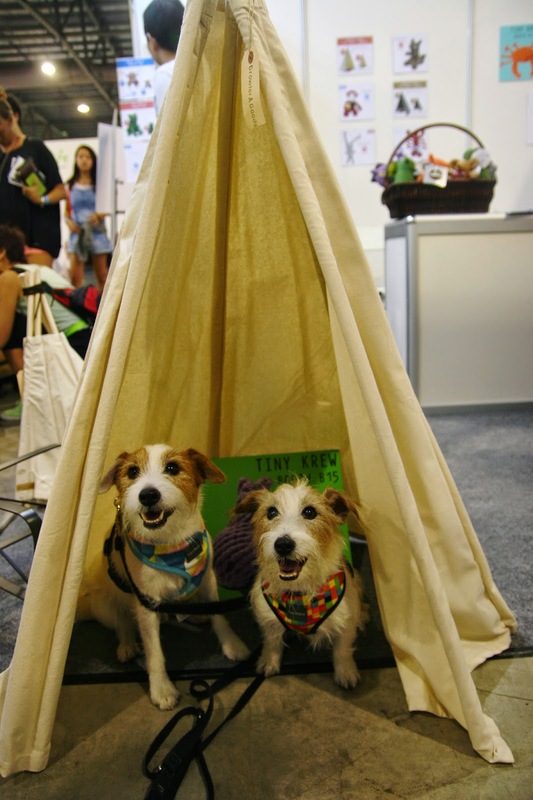 Pet Expo 2015 is happening this entire weekend! So don't forget to drag your parents out of the house to Expo Hall 8 for the awesome deals!